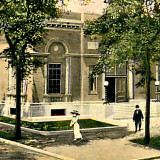 In the 1970s the Postal Service threatened to vacate a Classical-style post office at Broadway and Church Street, the "100 percent corner" in Saratoga Springs, New York. "Because the city government couldn't or wouldn't move fast enough, the mayor at the time, Raymond Watkin, sued as a private citizen to stop the process, and it worked," recalls former resident Mary Hotaling. Though most mail-handling for the city of 26,000 was transferred by the Postal Service to a new building about a mile away, postal officials bowed to local pressure and agreed to continue offering window service in the 1910-era building -- a landmark with marble columns framing its entrance. By 1995, however, the Postal Service had chopped up the interior with partitioning and had refused to make major investments in what was, by its calculations, an inefficient old structure. Despite its semi-dilapidated condition, the downtown post office had continued to draw 1,500 customers a day, mainly because it stood amid restaurants, stores, banks, and local institutions. "We thought that if the Post Office moved, it would be a disaster to downtown," says Geoff Bornemann, the city's planning director. 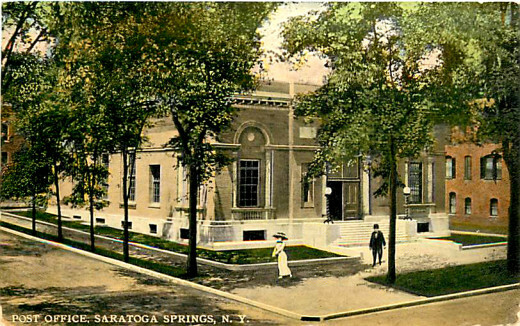 Postcard view of the downtown Saratoga Springs post office in its early days. Fortunately, an imaginative local developer, Jeffrey W. Pfeil, negotiated an unusual response to the Postal Service's neglect. Pfeil calculated that if he installed a rent-paying business (Coldwell Banker-Prime Properties) in half the building, over a period of years the stream of rental income would generate the $400,000 needed for restoration and improvements. That included bringing the grand lobby back to its former splendor and adding a discreetly designed handicapped-access ramp. Pfeil had to devote three long years to pushing his plan through the postal bureaucracy, but with the backing of the late Congressman Gerald Solomon, the building once again became an impressive anchor for downtown. Across Broadway from the post office is City Hall, a tall, Italian palazzo-style structure that continues to generate local foot traffic 131 years after it was built. From City Hall it's a short walk to the Saratoga Springs Public Library, built in 1995. 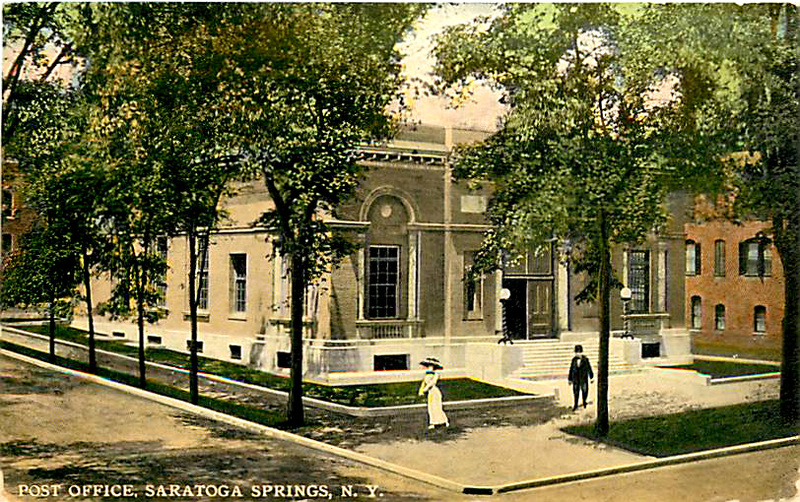 That 58,000-square-foot structure, which replaced a much smaller facility, was constructed a block east of Saratoga Springs' main retail street as a result of a consensus that the library should remain downtown. Its executive director, Harry Dutcher, sees the library as important to "keeping downtown healthy" and "keeping downtown relevant to the people who live here 12 months a year." 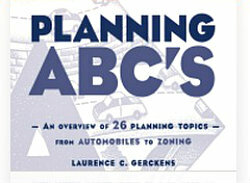 "I'm sure it would have been a lot easier to build on a suburban strip," he says. "The building could have been one-story." That would have cost less to build and operate than the three-story structure that ultimately came into being. The costs, in Dutcher's view, are justified by the fact that residents of close-in neighborhoods can walk to it and by the role the library plays in the community. Saratoga Springs is prospering. Developers are filling parking lots on Broadway with new buildings, some of them two, three, or four stories high, with a mix of retail, offices, and sometimes housing. Downtown storefronts, half-empty in the 1970's, are now full. The city's core looks handsome and distinctive. Public buildings helped make the revival possible.